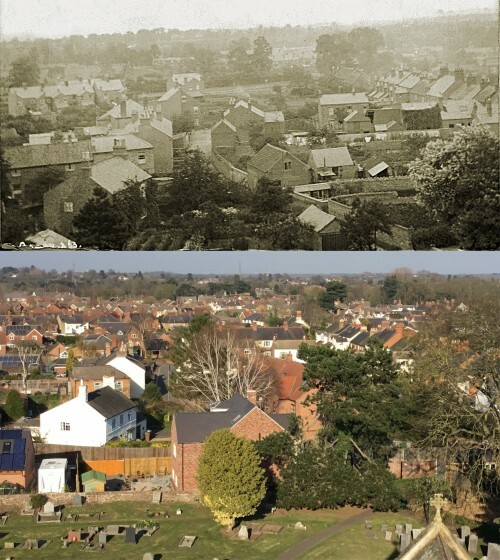 These photographs were taken from the top of the Church tower, looking towards Nursery Lane. On both pictures you can see Nursery Lane bending round to the left. The older picture was taken in about 1912 and the newer one in March 2019. The white house at an angle (bottom left on the older picture, behind a wooden fence on the newer picture), is Holly Cottage, 39 Nursery Lane. The other house with the white gable end wall on the newer picture (number 31), is the end of a row of terraced cottages and can be seen on both photographs. Station Road can be seen diagonally on the right. When comparing the two pictures, it can be seen how the village has expanded, and also that so many of the green spaces between houses have been developed. The older picture was discovered in an extremely faded form in the Leicestershire and Rutland Record Office. The museum team are extremely grateful to the Record Office for providing a scan that could then be enhanced to provide the picture you can see today.